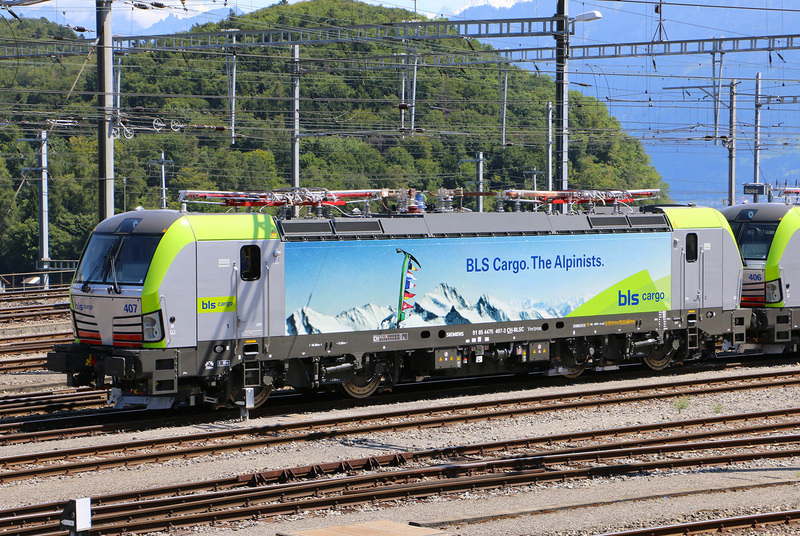 In March 2015, Swiss freight operator BLS Cargo decided to order fifteen Vectron MS electrics from Siemens. They will be used for long haul freight services connecting the Netherlands and Italy through the Alps. The country specific packages of the machines will include all equipment required for running in the Netherlands, Germany, Austria, Switzerland and Italy. The new locomotives are needed because BLS Cargo is facing the withdrawal of older series, and because it wants to strengthen its position on the long haul European corridor mentioned. At this moment, BLS Cargo already operates container shuttles connecting Rotterdam (NL) with Melzo (IT) using Bombardier Traxx MS locomotives in cooperation with ERS Railways / Freightliner. In the past months, BLS Cargo has evaluated several modern electrics on their network. They have decided to go with Siemens. The new machines will be delivered in three separate batches. The first locomotives will be delivered in the second half of 2016. The delivery will be completed in 2018. Seen today in Kaldenkirchen [DE] by Jeroen de Vries. The first new shuttle Kaldenkirchen (DE) - Domodossola (IT), pulled by BLS Cargo 193 405. Michael Goll sent us this nice gathering of BLS Cargo Vectron locomotives at Basel, Badischer Bahnhof on 09.10.2016, thanks! Joachim Bertsch saw BLS Cargo 475 404 today, pulling an car train (Marchegg - Mulhouse) from Buchs to Basel. Our first image of a BLS Cargo Vectron in revenue earning services. Since 22.09.2016, images appear of the first BLS Cargo 475 series locomotives pulling revenue earning services. No. 401-404 are in Switzerland now. No. 405 is next and was portrayed by Tobias Schmidt on 24.09.2016 at Basel Badischer Bahnhof. No BLS Cargo logos and stickers yet. Romain Constantin shows us this picture of BLS Cargo's Vectron no. 401 running tests with a Re 485 series locomotive. Together they were seen on the the Summital - Lötschberg route (Spiez - Brig). Peter Lovell and Tobias Schmidt were able to portray BLS Vectron no. 401. The machine is out and about with personnel of BLS Cargo, as seen in Spiez and Basel. On 29.04.2016 BLS Cargo and Siemens presented the Vectron locomotive in Spiez. Unit 401 was inside, among many other BLS locomotive types, machine 402 was seen outside, pretty in the sun. Remarkable: CH was not crossed out in the UIC raster on the locomotives, although the locomotives were not homologated for this country yet. Still some approval work has to be done: the homologation for Switzerland, for customer operation, is expected to be granted by the end of June 2016. First commercial services then should be within Switzerland from Basel with petrol trains. The authorization for Italy is planned for the end of 2016, and authorization for the Netherlands should follow medio 2017. Tobias Schmidt was able to make pictures of the new BLS Cargo 475 401 and 402 today. This week, BLS Cargo will present its first two Vectron locomotives. Today RailAdventure took the 401 and 402 to Basel. Yes, the machine have no 193 series numbers anymore. We have created a new design impression of the Vectron in the livery of BLS Cargo. This version is based on the recently broadcasted tv item about the Siemens Munich-Allach factory. Dark grey rooftops. Limegreen all the down to the frame, numbering in the 475 400 series. All Railcolor design impressions are being collected here. The Vectron locomotives for BLS Cargo will be silver, with shiny black rooftops. The lamp posts and the sides of the cab roofs will get the welknown lime green color. The machines will form the 475 series. (videos are only available until 07.03.2016). The Netherlands is still awaiting the debute of Siemens' Vectron on its rail network. Siemens however expects the electric locomotive to be homologated in this country by the end of 2016. Preparations of the test phase have started. BLS Cargo is the first operator to have Vectron-locomotives fit for the Dutch rail network on order. It wants to haul freight trains to Rotterdam with Vectron MS locomotives as of 2016. BLS Cargo is showcasing a Vectron model in its corporate colours. Fur sure not the final design, but nice to see. After several generations of Bombardier Traxx locomotives, Swiss freight operator BLS Cargo has now decided to order fifteen Vectron MS electrics from Siemens. They will be used for long haul freight services connecting the Netherlands and Italy through the Alps. The country specific packages of the machines will include all equipment required for running in the Netherlands, Germany, Austria, Switzerland and Italy. This means Siemens still has some homologation work to do. The Vectron MS version is not yet homologated in Switzerland, nor in the Netherlands and Italy. Especially in the Netherlands serious testing effort is still required. This country has not been part of the dynamic testing program for the Vectron until now. Read the complete press statement at blscargo.ch.